The ISS Progress 32 cargo craft (center) docked to the International Space Station on Feb. 13, 2009. An unmannedRussian space freighter docked at the International Space Station early Fridaywith a fresh delivery of chocolate and coffee for the orbital outpost?s three-astronautcrew. 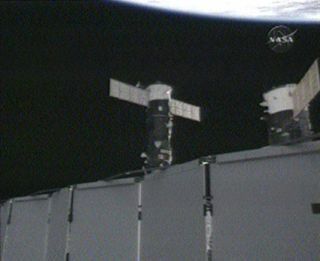 The automatedcargo ship Progress 32 docked smoothly at a berth on the station?s Earth-facingPirs docking compartment at 2:18 a.m. EST (0789 GMT) as both spacecraft flew 215miles (346 km) above southwestern China near the border of Mongolia. ?Today?s aspecial day,? space station commander Michael Fincke, of NASA, called down toMission Control after Progress 32?s arrival. ?Thank you.? The dockingoccurred nearly three days after two satellites - one American, the otherRussian - accidentally slammedinto each other 490 miles (790 km) above Siberia in anunprecedented collision. NASA and the U.S. Space Surveillance Network aretracking two large debris clouds from the impact, but currently believe theyrepresent only a slightincrease in risk to the space station. To makesure Friday?s docking went as planned, Russian cosmonaut and flight engineerYury Lonchakov watched over the cargo ship?s arrival from a terminal inside thespace station, where he floated at the ready to take remote control of theunmanned spacecraft should it veer off course. Lonchakov had to manually guidein the last cargo ship that arrived at the station, Progress 31, during itsNov. 30 docking. But Friday?srendezvous appeared to be flawless, with the two spacecraft linking up withoutthe need for human intervention. ?Thank youfor the spacecraft and thank you for Progress,? Fincke radioed down to thestation?s Mission Control Center in Russia. Progress 32launched into space on Tuesday to deliver more than 2 1/2 tons of fresh suppliesfor the space station crew. The astronauts were eagerly awaiting the spacecraft?sarrival, since it was carrying a new batch of chocolate, instant coffee andother special requests in addition to its normal shipment. ?We usuallylike to get fresh fruit, onions and garlic,? station flight engineer SandraMagnus of NASA told SPACE.com last week. ?It?s like Christmas all overagain when you get a vehicle docking to the space station because they alwayshave special treats for us.? Also packedaboard Progress 32 are more than 1,910 pounds (866 kg) of propellant for thespace station's engines, 110 pounds (50 kg) of oxygen and air and 2,866 pounds(1,298 kg) of dry cargo, which includes food, clothing, experiment hardware anda brand new Russian-built Orlan spacesuit, NASA officials said. Fincke andhis crewmates are expected to open the hatches between the station and Progress32 later today at about 5:15 a.m. EST (1015 GMT). With Friday?sdocking of Progress 32 complete, the space station astronauts can turn theirfull attention to preparations for the planned arrival of NASA?s space shuttleDiscovery this month. Discoveryis currently slated to launch toward the International Space Station noearlier than Feb. 22 and dock two days later, though an official launchdate for the mission remains unsettled due to ongoing fuel control valveconcerns. Top NASA officials plan to review the valve test data later today andmeet on Feb. 18 to revisit plans for the Feb. 22 launch target. Commandedby veteran shuttle flyer Lee Archambault, Discovery?s seven-astronaut crew isgearing up for a two-week mission to deliver the final set of U.S. solar arraysto the International Space Station. The shuttle is also bringing up Japaneseastronaut Koichi Wakata, who will replace Magnus aboard the station as a memberof the outpost?s Expedition 18 crew. Magnus haslived aboard the space station since last November and is due to return toEarth aboard Discovery.